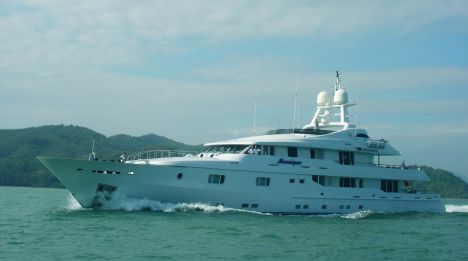 "Mosaique", a wonderful M/Y, 50 metres in length, has a Master with a very adventurous life: Brian Chick. I knew him while he was sitting next table to me at a certain dinner and we soon begun talking about his working experiences and . interviewing came soon afterwards. Captain Chick, you are British, speaks Italian with Spanish accent. Where were you born and how did you first approach the sea? I was born In London where I spent my childhood. An uncle of mine had a small centreboard, a 5 - metre dinghy; so I already at an early age learnt to sail, navigating with him in a South district of England called Solent. I obtained the Diver's patent for working on offshore rigs, aged 20: North Sea, Red Sea, Tasmanian Sea, and Indian Ocean. Is it a dangerous job? A bit. At the age of 26 I changed my life and married a German woman working in hotellerie but as great loving sea and sailing as I. From then on we always do all together and she works still now with me on board "Mosaique" and helps me manage the boat that means a great business indeed. In those days we were young and bought a 13 - metre catamaran, by which we crossed far and wide the Mediterranean Sea. Then, not enough satisfied of, we crossed the Atlantic till Caribbean Islands too, meeting also very rough seas. For a year and a half we sailed around these Islands living by working as day - work skippers. In 1984 we came back to Europe and I entered the yachting world thanks to contacts made in South Spain. Which was your first boat? An "Atlantic Tess", 25 metres in length. Then I moved and worked by an owner, who had two yachts and two masters on board: so the other master and I alternated our working between a Baglietto, 32 metres in length, and a Sportfish boat, 18 metres in length by the Viking Yard. We chartered in Italy and Spain in those days. Ten years ago I drove with my wife the Sportfish to Caribbean Islands and then to Fort Lauderdale where we sold her. I had meanwhile made contacts with a lot of people and so I could stop there and worked in delivery - refit - charter fields as free - lance master operating when an owner wanted to make a trip but he couldn't make it alone. When did you qualify as Yacht Offshore Master? In 1982 I first qualified as Yacht Offshore Master at a British school and then I obtained the 4 - 3000 tons patent under the British Law. Indeed, on human and professional point of view you seem very flexible to me. What have you yet done? Yes, I feel so. I also built with my wife a 15 - metre motorboat waiting in Florida for our retiring. Five years ago the International Yacht Charter called on me for working as corporate captain: I bought new boats in Italy and sold them in the U.S.A. I must come in Italy and look at them, supervise whichever working at; after then I must drive them overseas and sale them. As the patent class 4 finished I commanded for the first time a yacht, 33 metres in length, from The Pisa Yard. Now I work on board "Mosaique", a 50 - metre motoryacht owned by a British. Which cruising have you yet made? The Greek Island, Caribbean Islands; moreover we had many a time crossed the ocean. Last year we were in Thailand. How does the yacht behave in rough seas? Well, she is a very sea keeping boat. She was built in Turkey at the Proteksan Yard by the Architect Dubois. Caribbean Islands and then we will come back to the Mediterranean Sea and start cruising around the world, sometimes navigating with the owner sometimes chartering. What would you say to a young man/woman wishing to make your job? Well, there is a hard world because the youth are not so familiar with working from 7.00 am to 2.00 am of the next day. Living in nature among nice people, a very luxurious world, I say. Safety of boat and people on board. This yacht means a high responsibility; if I quantify, she means a business worth 25 millions dollars. Main boat's features: built in Turkey in 2001 at the Proteksan Yard; metal hull and aluminium deck structure. Length: 50 metres; Beam: 9.5 metres; Draft: 2.7 metres. Main engine: Caterpillar 3508; Cruising speed: 13.5 knots; Cruising range: 50A communication system features a complete package including internet access wifi 24/7. Interior design (colours, materials, décors, lighting. ): On board Mosaique there is accommodation for 12 passengers comprising Master and Vip staterooms on the main deck while the guest ones are on the lower deck. Bathrooms are in marble and onyx from Italy and Turkey. The furniture is coated with mahogany; tapestry and bedspreads are of silk. A computer controls the lighting intensity. Favourite Marinas: all harbours offering free mooring. Favourite Routes: all seas around the world. What kind of yachting innovations does impress you greatly and why? Mobil technology, because it let me organize everything, even being ashore. What about your worst adventure as Captain? The Tsunami in Thailand last winter. And your more beautiful memory of? Well, I was alone on guard crossing the ocean in flat seas. while dolphins were playing with spray lifted by the bow. What do you think about your role as Captain and the yachting world in which you operate? Indeed, it is difficult and stressful to work in it, above all when chartering on board a so as always full yacht as Mosaique is; satisfactions are even so great either on moral or material point of view that they fully repay me for all.